The captions to some of the images on this site include the names of individuals. If you think you have been mistakingly named, or if, for privacy reasons, you wish to have your name removed, both from this site and from the Alresford Heritage data base, please contact me on the above email address. 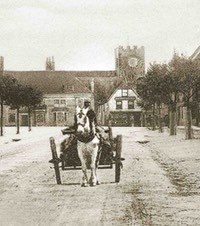 The images on this site have been collected over many years and together with those kindly sourced by individuals and organisations connected with the town, they form a valuable historical record and fascinating insight into the buildings and the daily lives of the people who lived and worked in Alresford and the surrounding villages during the past century. What began many years ago as a small collection of old postcards and photographs has now grown in to a large digitised archive library. The aim has always been to build one central depository for old photographs of the town. The advent of the world wide web and the ever increasing access to it by home users has enabled the collection to be viewed by a far wider audience. To enable this site to grow I would appeal to anyone who has any old photographs to contact me so that they can be added to the archive and the web site. Any photographs loaned will be copied, digitally restored if necessary and the originals returned, undamaged, to the owner. Do you have any old photographs of Alresford or the villages? Would you be willing to have them added to the archive? Old photographs of the town, the villages, buildings, shops, people, organisations, clubs, societies, workers, businesses, cubs, scouts, brownies, guides, etc. Your old photograph which may seem of little interest to you may be of great interest to others! Also, we are always pleased to hear from anyone who can add any information, corrections, or additions to the captions that appear under the photographs on the site and also from anyone who has any comments about the site in general. This site is a non profit making venture and it is intended that all of the photographs contained in the archive will remain available as a resource for future generations in Alresford. Several examples of the prints from this collection are on display around the town, for example on the display boards leading to Courtyard Tearooms in Broad Street, and in the window of Oakleaf Stationery in West Street. There are copyright laws governing the use of photographs not taken by oneself, or whereby you do not own such copyright, and I will do all in my powers to avoid breaking any of these laws. If I have inadvertently used any copyright material then I will immediately remove the material from the website upon notification, or, if preferred and acceptable, credit the photograph(s) with the copyright holders details. No images from this website may be reproduced without my express permission.